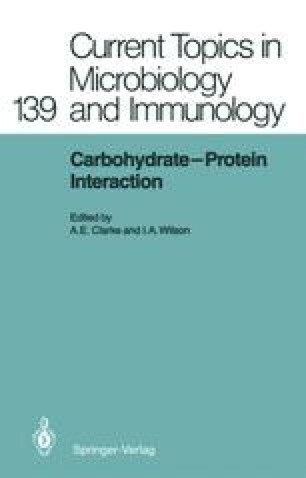 Carbohydrate performs a diverse range of cellular functions, from those as structural components and storage macromolecules to playing a central role in cellular development and cell-cell recognition. This functional diversity is paralleled by the large variety of macromolecules that contain carbohydrate. These can be divided into four main groups: (a) polysaccharides, (b) proteoglycans, (c) glycoproteins, and (d) glycolipids. Although some “classical” polysaccharides are now known to contain small amounts of covalently bound protein, for example, glycogen (Butler et al. 1977; Rodreguez and Whelan 1985), the common names are used in this review. The term proteoglycan refers to polysaccharide chains covalently attached to protein, and the term glycoprotein refers to monosaccharide residues or oligosaccharide chains covalently attached to protein (Hughes 1983).